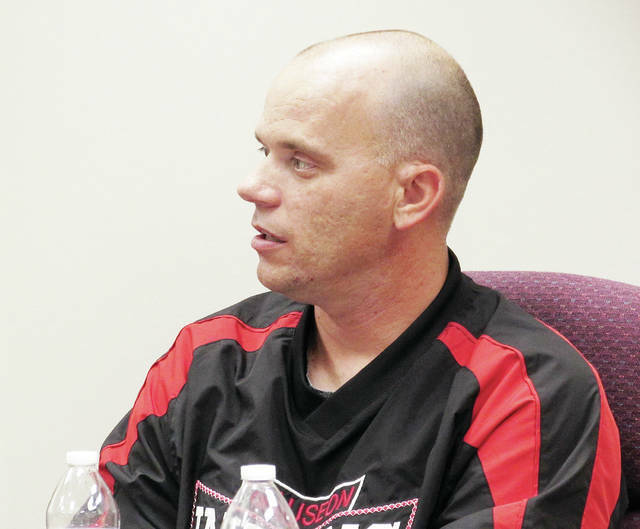 As a member of the Wauseon City Council Utility Committee, Shane Chamberlin discussed city water line issues at Monday’s meeting. Several issues were covered at a short Wauseon City Council meeting held Monday, including water lines and subdivision lighting. The meeting began with a public hearing regarding a request to rezone property at 1201 N. Ottokee St. from an R-2 single family designation to R-4, multiple family. No members of the public came forward, and the hearing was closed. The rezoning would allow for the sale of the property. The Council approved a recommendation by the Utility Committee for a 450-foot water line extension down Dickman Road that is needed by Haas Door to accommodate the company’s planned 150,000 square-foot expansion. The extension goes against a city code requiring it to cross the entire frontage of Haas Door’s property, so that future development behind the company’s property would have access. Public Service Director Dennis Richardson said at the committee’s Nov. 8 meeting that crossing the frontage is unnecessary, since the company owns the property and have planned an expansion. Committee member Shane Chamberlin read a provision in the committee’s recommendation “that if it was ever necessary to complete the water line to the edge of the property that the owner, Haas Door, will be responsible” for the cost. The company will be required to sign an agreement. “We’re trying to do our very best to help with the expansion of an existing business,” Chamberlin said. The cost of the project is estimated at $20,000 if the city’s Public Works Department does the labor. Grant money to fund the project may be possible through efforts by the Fulton County Economic Development Corporation. Council members also approved the rerouting of a sanitary sewer line the city recently discovered is running across the property of a citizen. According to the Utility Committee, the sewer line will be moved to about 360 feet parallel to Zenobia Street between Linfoot and Maple streets. The city will pay the 2019 project’s $10,000 cost. Chamberlin discussed the committee’s recent meeting regarding the proposed installation of street lights in the city’s Old Orchard subdivision. A past survey of residents there showed the majority of the 10 respondents favor street lighting,. The subdivision was approved for construction without lighting. Per city code, the $1,000 per light cost would be split evenly between the city and the subdivision’s residents. After further discussion, the Council agreed the issue would be revisited once the city further researched pricing options. And Chamberlin reported that the Ohio Department of Transportation plans to extend the Airport Highway-Shoop Avenue resurfacing project scheduled for 2019 to the east, down Airport Highway. He said the city’s share of the extended portion is approximately $10,000. Council members approved the Park Board’s recommendation for four repaving and repainting projects, three of which would cost an estimated $45,000 each. They include sealing and striping Dorothy B. Biddle Park to add about 1,200 parking spaces; sealing the park’s walking trail; repaving and re-striping Reighard Park near the community swimming pool; and sealing, resurfacing, painting and striping the city tennis courts. The council agreed the projects will be completed as money is available. “It’s not as if any one of these projects couldn’t be held off a year longer if we see there isn’t enough money in the budget to do something,” Frey said. He said a tree memorial for the late Perry Rupp was recommended during the board’s Nov. 13 meeting. A city resident, former Fulton County Commissioner, and Clinton Township trustee, Rupp, 61, died July 22. Frey said the memorial would consist of a memorial brick and three or four crabapple trees planted at the corner of Glenwood Avenue and Linfoot Street in a 40-foot by 70-foot boulevard next to Dorothy B. Biddle Park. There would be no cost to the city. Frey told the council the city’s Tree Commission will plant 50 trees of various species in a wooded area in Homecoming Park where damaged ash trees had been removed. Police Chief Keith Torbet said the names of 75 children have been submitted for Christmas For Kids, a charity event to be held Dec. 8. He said the program has thus far received enough donations to accept all the requests, but will continue accepting donations in an effort to ultimately gift each child with $100. Checks can be made to the Wauseon Fireman’s Association, the fiscal agent for collections. “Christmas For Kids” should be written on the check’s memo line. Donations of cash or checks can be delivered to the police department or any city department at 230 Clinton St. The event for underprivileged children will begin with a 9 a.m. breakfast at the city fire station, then continue with a 9:45 a.m. parade of emergency vehicles to Walmart on Airport Highway for a shopping spree. • Waiving three readings and approving on emergency an ordinance amending Codified Ordinance Chapter 1117, establishment of districts and maps, and amending the official zoning map. • The second reading of a resolution authorizing a city agreement with Fulton County Commissioners for indigent defense services. • A motion to approve a total of $3,250 for city employee holiday gifts.